“You are invited” is a pleasant phrase to us. However, if we get hundreds of invitations in a month, it may not make us happy. This is also true for academic invitations. A published author may get two types of invitations – solicited and unsolicited. 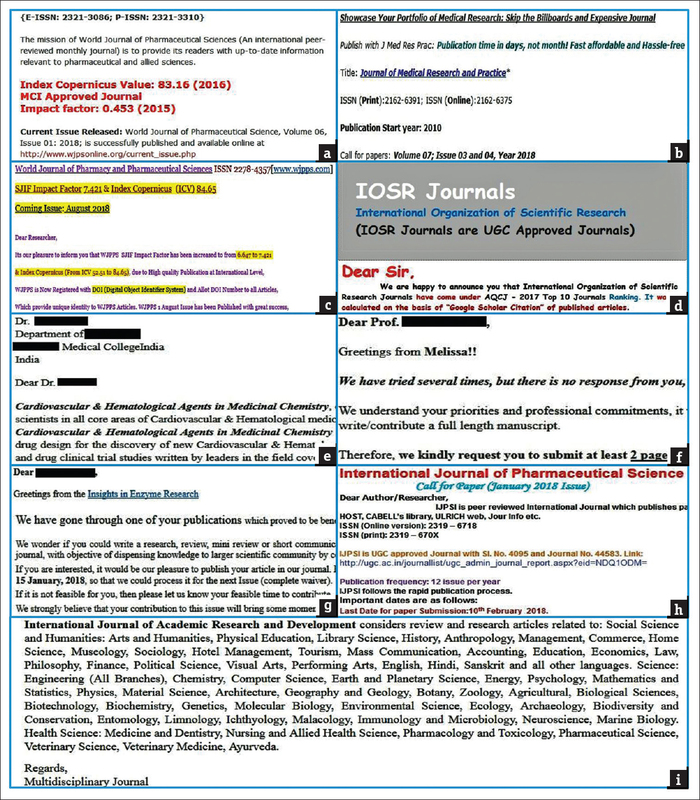 A corresponding author commonly starts receiving e-mail invitations after the publication of her/his first article with e-mail address accessible to readers. Some invitations are about publication of the manuscript, some are about conference invitation, and some are about the publication of the book, etc. These unwanted e-mails are primarily received from questionable or predatory journals., When these unsolicited e-mails surpass the number of relevant e-mails, the receiver finds difficulty in segregating important e-mails from huge number of e-mails containing spam. A previous study has analyzed spam e-mails received by senior academicians and concluded that academic spam is very common and it is difficult to avoid those e-mails. Senior academicians are experienced in publication. Hence, despite the disturbance, they are less likely to be allured by those invitations. In contrast, young authors are prone to fall into the trap of rapid and easy publication offers. To the best of our knowledge and extensive literature search, no study has been conducted to assess the pattern of unsolicited academic e-mail invitations to young authors in India. With this background, the aim of this study was to (1) assess the number and type of unsolicited academic invitations received by young Indian authors and (2) test the effect of an intervention on reduction of number of unsolicited e-mails in inbox. This study involved the analysis of e-mail invitation received in the e-mail account of participants. All the participants were adult (age >18 completed years) and provided written consent for participation in the study. All the participants were also informed that they can quit from the study at any moment without stating any reason. They were well informed that the data they share would be used in a publication without revealing their identity. This study was designated with an acronym “SPAM” which indicates “Sunday Periodical Analysis of unsolicited e-Mail.” This acronym was given according to the context and data collection method of the study. This study was divided into two phases. The duration of the first phase was 6 months. In this phase, reports about number and type of unsolicited e-mails were collected. The duration of the second phase was 3 months. In this phase, an intervention was used to reduce the number of unwanted e-mails in the inbox label. Then, number of unsolicited e-mails in different labels was collected. Hence, this study was a prospective cohort study. Data of this study were primarily collected by the participants from their e-mail accounts. For this data collection, the authors used either their personal computers or any mobile device. Details of the device, browser, or application used for data collection were not recorded as it had no impact on the study. Data collected by participant authors were shared with the corresponding author of this article through e-mail. Hence, the settings were the World Wide Web, e-mail accounts, and personal computers with various configurations. There were no exclusion criteria. The corresponding author of this article was fulfilling the above criteria. Considering the scarcity of participants, the corresponding author was also included as a participant in this study. Hence, a total of 12 participants were taken as final convenience sample for the study. 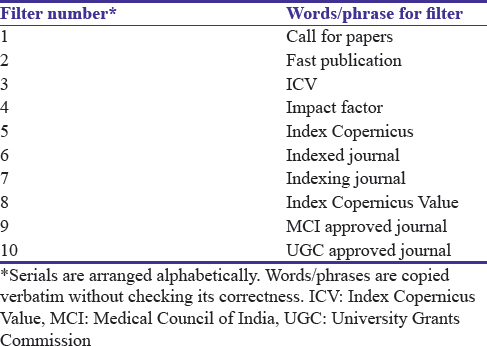 Characteristics of the participants were recorded regarding publication experience in months, number of published articles, and indexing of the journal where the article was published. Number of e-mail with request to review a manuscript as a peer. After recording these details, they were instructed to delete all those unsolicited e-mails. They were also instructed that if some e-mails seem important to them, they can store it in a different label for personal use. They were provided guidance about how to create a new level and move a particular e-mail there. This weekly data collection was done for 6 months (180 days) which ended on December 29, 2017. Only the e-mails of the corresponding author of this article were possible to analyze. The text of the unsolicited e-mails was copied and pasted in a word document. Those e-mails which contained image were captured by screenshots for storage. These two types of stored materials were analyzed qualitatively. For the intervention to implement, a list of common words and phrases were made as shown in [Table 1]. Further qualitative observations were about the type of greetings, type of information they know about the authors, journal impact factor, and promptness of the service the journal provides, scope of the journal, indexing information, etc. As these were not the primary aims of this study, these are discussed in “Discussion” section of this manuscript. On December 30, 2017, the authors were again informed about how to make filters to divert e-mails to a particular label. As all the authors were using Gmail, only the procedure of setting filters in Gmail was described to them. The principal steps are shown in [Figure 1]. Participants were instructed to make filters with the words/phrases shown in [Table 1]. 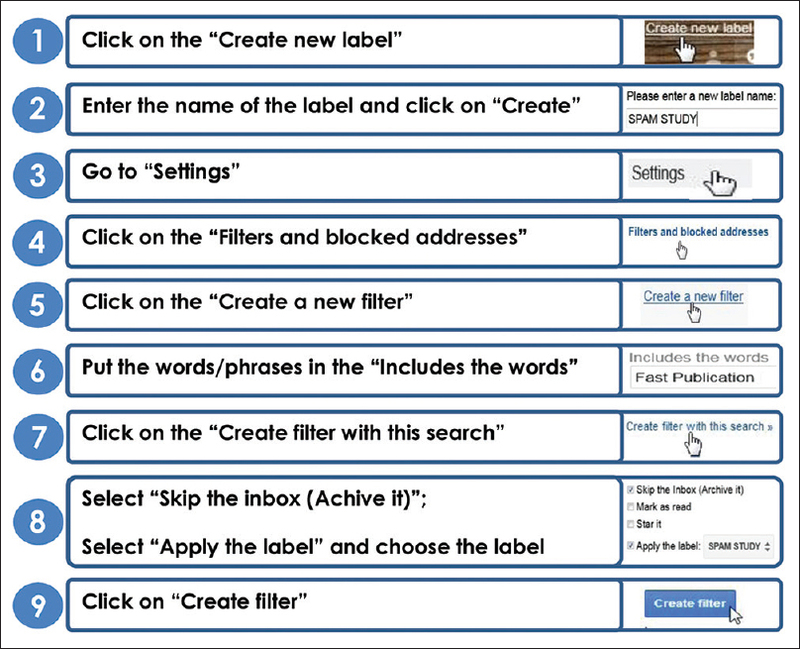 After setting those filters, the e-mail containing the words/phrases would skip the inbox and would be stored in the SPAM STUDY label. Postintervention data collection was done for 3 months (90 days). Categories of collected data were different than the preintervention data. In preintervention, data about the unsolicited e-mails and category of e-mails were obtained from the inbox and spam label. In the postintervention phase, number of unsolicited e-mails reaching the inbox, SPAM STUDY, and spam label were recorded. Category-wise e-mails were not recorded. Weekly report of total unsolicited e-mails and academic unsolicited e-mails for each author for 180 days was added to get total numbers of e-mails. Categorical e-mails (namely, manuscript, book/chapter, conference, editorial board, and review) were also added for 6 months and divided by total academic e-mails times 100 to get percentage. Categorical data were compared by Chi-square test with α = 0.05 [Table 2]. In the preintervention phase, for each author, total number of academic e-mails and total number of e-mails received in inbox, and spam label was added and divided by 180 to get average mails per day. Similarly, in 90 days postintervention period, for each author, unsolicited e-mails were added (for each category of inbox, spam label, and SPAM STUDY label) together and divided by 90 to get average e-mails per day. Then, the mean and standard deviation was calculated and compared by using paired t-test with α = 0.05 [Table 3]. In all the statistical tests, the P value was considered statistically significant if the two-tailed value was <0.05. For analysis of data, two software packages were used. For tabulation and finding mean and standard deviation, Microsoft Excel 2010 (Microsoft Corporation, USA) was used. For all other statistical tests, GraphPad Prism 6.01 (GraphPad Software Inc., La Jolla, USA) was used. Among the 12 participants recruited in the study, a total of 7 participants were able to provide complete data for the full duration of the study. The five participants were dropped in the preintervention period. The characteristics of the participants are shown in [Table 4]. Unsolicited academic invitation received by the participants during the preintervention phase is shown in [Table 2]. Young Indian authors received an average of 5.27 ± 0.93 (2.04 ± 0.28 in inbox and 3.23 ± 0.89 in spam label) academic invitations per day [Table 3]. Preintervention number of e-mails in the inbox and spam label and postintervention number of e-mails received in inbox, SPAM STUDY, and spam label are shown in [Table 3]. There was a significant decrease (2.04 ± 0.28 vs. 0.08 ± 0.02, P < 0.0001 in paired t-test) in the number of unsolicited e-mails reaching the inbox after the intervention. With the aim to find the number of unsolicited academic invitations and category of invitations, this study found that young authors receive on an average 5.27 ± 0.93 e-mails per day. This creates a huge number of unwanted e-mails in 1 week. If an author tries to check her/his mailbox after 1 week, she/he may need lot of time to check each e-mail and segregate important one from unimportant one. However, not only academic invitations but also other promotional e-mails are received by authors. Nonacademic unsolicited e-mails may come with an offer to credit a hefty amount to bank account, a credit card or loan without the income details, or even a dating offer from a nearby singles! What type of invitations and why? The Medical Council of India (MCI) has fixed the criteria for the promotion of medical teachers for Indian colleges and universities. Research publication is one of the major criteria. However, MCI only count the “Original article” as a publication. A meta-analysis or a rare and interesting case report is nothing to them. University Grants Commission of India also considers published articles for promotion of the faculty. Hence, college and university teachers, both medical and nonmedical, need to publish their research articles. This need has been taken as a business opportunity by some technical personnel who even run multiple journals from a single room office. Hence, these journals with questionable credibility cannot maintain basic quality of scientific publication, especially peer-review and language editing. However, these firms commonly collect e-mail addresses of published authors and start sending invitations for publications. In this study, it was found that maximum numbers of e-mails invite the authors to publish the manuscript in their journals. Next business model invites authors for conferences [Table 2]. It is common that participant pays money to attend a scientific conference. Hence, some businessmen smelled money in this business. Even these businessmen accept nonsense as abstract for presentation. Young authors need to be very careful about selecting these types of questionable invitations. In addition, publishing book from a predatory publisher or get included in the editorial board of a predatory journal does not increase the reputation. How unwanted e-mails can be prevented? The total e-mail we receive contains more than 85% of spam e-mails. Many authors are irritated with this issue and want to get rid of this nuisance. However, there is no perfect way to get rid of these e-mails as the promoters start new strategy to reach the author when one path is blocked. There are several methods to limit the unwanted messages. Simply deleting the message may be suggested, but to do that, the authors need to check the sender of the message at least. Another method is threatening the sender. However, it may not be possible for every author to be so proactive. Many of the e-mail contains an “Unsubscribe” button. However, these may contain malware or phishing link for stealing your personal data. Another option e-mail senders provide is “send a reply with unsubscribe as a subject.” This may also let the sender know that you at least have seen their message. This may prompt them to reach you from their sister journals. In this study, a targeted filter with some commonly used words/phrases was used. Our finding was impressive and authors could divert unwanted e-mails to a particular label in Gmail [Table 3]. This method cannot be considered fully effective as any invitations which are devoid of any of those words can reach the inbox. However, alluring Indian authors without these words/phrases [Table 1] may be difficult for promoters. How impressive e-mail invitations are? Some promoters invest less time in sending invitations and use a generic e-mail to every author. Some e-mails are black and white or in dual color, and some are decorated with bright color combinations. Who do not like a kaleidoscope? Examples are shown in [Figure 2]a, [Figure 2]b, [Figure 2]c, [Figure 2]d.
Not only they send colorful invitation with various fonts but also they provide hassle-free publication in days! Greetings of the season may welcome you to the e-mail, or the sender may wish that you are doing well. However, more professional sender would include your name in the beginning. Further, you may be astonished to see an official letter like structure with your name, designation, and your correspondence address. Examples are shown in [Figure 2]e and [Figure 2]f. You may mistake it to be a promotion letter as they commonly address all with “professor” despite your current designation. When a reader reads your paper and sends you a feedback, you must be feeling good. This strategy has also been taken by promoters. Screenshot in [Figure 2]g is an example. For impressing you, journals can even send you their proof of credibility as shown in [Figure 2]h. Does not it attract you? Some of the journals would offer publication of narrow scope and some publish everything in the universe in one journal. We counted the specialty covered by a journal was 62 [Figure 2]i! Young authors should learn about ignoring these kinds of alluring e-mails from questionable journals. A list to identify questionable journals can be found in the article by Laine and Winker. Limited literature is available on this topic. A study by Grey et al. provided the result of five senior academicians. In contrast, the current study was concerned about young authors. Grey et al. reported that senior authors receive an average of two e-mails per day. The result of this study showed that an average Indian author may get 5–6 e-mail invitations per day. The underlying reason may be the pressure to publish to Indian authors without supportive research environment. Above all, a huge number of Indian authors publish in questionable journals. Mercier et al. analyzed unsolicited e-mails of a single young author, affiliated with Canadian and Australian institutes and revealed that 502 invitations were received in a year. Among the invitations, 47.2% were invitation for manuscript submission. A study by Clemons et al. showed that an author received 578 unsolicited e-mails in 90 days. Among the e-mails, 33% was requesting articles, followed by conference invitations (18.9%). In this study, the invitation for the manuscript was more than double (99.16%) than those studies. Maybe Indian authors like to publish the manuscript, especially “Original article” more than other category for promotion. In the study by Mercier et al., only 2% of invitations were from India. Country-wise list was not possible to analyze in the current study due to time and commitment limitation of the participating authors. This study had several limitations. First one was the limited numbers of authors participated in the study. For the study, 12 authors (including corresponding author of this study) were recruited. However, 5 (42%) authors were dropped from the study. For data collection, the data supplied by the authors were taken as final; there was no scope to cross-check the report due to privacy issues. For postintervention phase, data for 3 months were collected. In contrast, data for 6 months were collected in the preintervention phase. This may be a weak point for comparative analysis. For intervention, only a single method (i.e., creating filter to divert e-mails to a different label) was used. “Unsubscribe” method, “mail and unsubscribe” method was not feasible to check due to chances of data theft of the authors. Among the different types of spam invitation a young author receives, manuscript submission request is the most common type. The method of using e-mail filters can effectively reduce the number of unwanted e-mails mixing with solicited e-mails. However, there are some limitations of this method. Any solicited e-mail containing the words/phrases set for filtering unwanted e-mails would reach the new label. Hence, the authors should use it with precautions. Further studies are needed to explore any other innovative idea to limit or stop receiving these space-occupying unsolicited e-mails. The young authors participated in this study and spent their valuable time in counting spam emails in Sundays! The author would like to thank them for their active participation without which this study could never be possible. The author also would like to thank the dropped out authors. Their encouragement during the initial phase of this study inspired them a lot. As an Author, what does Publishing Open Access Mean for you? Nature.com. Available from: https://www.nature.com/openresearch/about-open-access/benefits-for-authors/. [Last accessed on 2018 Jul 10]. Cartwright VA. Authors beware! The rise of the predatory publisher. Clin Exp Ophthalmol 2016;44:666-8. Definition of Spam in English. English Oxford Living Dictionaries. Available from: https://www.en.oxforddictionaries.com/definition/spam. [Last accessed on 2018 Jul 11]. Kozak M, Iefremova O, Hartley J. Spamming in scholarly publishing: A case study. J Assoc Inf Sci Technol 2016;67:2009-15. Kebede M, Schmaus-Klughammer AE, Tekle BT. Manuscript submission invitations from 'predatory journals': What should authors do? J Korean Med Sci 2017;32:709-12. Betz CL. Authors beware: Open access predatory journals. J Pediatr Nurs 2016;31:233-4. Grey A, Bolland MJ, Dalbeth N, Gamble G, Sadler L. We read spam a lot: Prospective cohort study of unsolicited and unwanted academic invitations. BMJ 2016;355:i5383. Bandewar SV, Aggarwal A, Kumar R, Aggarwal R, Sahni P, Pai SA, et al. Medical council of India's amended qualifications for INDIAN medical teachers: Well intended, yet half-hearted. Natl Med J India 2018;31:1-4. Draft UGC Regulations on Minimum Qualifications for Appointment of Teachers and Other Academic Staff in Universities and Colleges and Measures for the Maintenance of Standards in Higher Education. New Delhi: University Grants Commission; 2018. Available from: https://www.ugc.ac.in/pdfnews/5323630_New_Draft_UGCRegulation-2018-9-2.pdf. [Last accessed on 2018 Jul 21]. Yadav S. Explained: How the Pay-and-Publish Business Works. Available from: https://www.indianexpress.com/article/explained/how-the-pay-and-publish-business-works-5265198/. [Last accessed on 2018 Jul 21]. Hunt E. Nonsense Paper Written by IOS Autocomplete Accepted for Conference. The Guardian. Available from: https://www.theguardian. com/science/2016/oct/22/nonsense-paper-written-by-ios-autocomplete-accepted-for- conference. [Last accessed on 2018 Jul 21]. Laorden C, Ugarte-Pedrero X, Santos I, Sanz B, Nieves J, Bringas PG. Study on the effectiveness of anomaly detection for spam filtering. Inf Sci 2014;277:421-4. Clemons M, de Costa E Silva M, Joy AA, Cobey KD, Mazzarello S, Stober C, et al. Predatory invitations from journals: More than just a nuisance? Oncologist 2017;22:236-40. Cressey D. Dear Highly-Esteemed Expert: How to Cope with Academic Spam. Nature News: Q&A. Available from: https://www.nature.com/news/dear -highly-esteemed-expert-how-to-cope-with-academic -spam-1.21158. [Last accessed on 2018 Jul 22]. Mazzarello S, Fralick M, Clemons M. A simple approach for eliminating spam. Curr Oncol 2016;23:e75-6. Laine C, Winker MA. Identifying predatory or pseudo-journals. Biochem Med (Zagreb) 2017;27:285-91. Seethapathy GS, Santhosh Kumar JU, Hareesha AS. India's scientific publication in predatory journals: Need for regulating quality of Indian science and education. Curr Sci 2016;111:1759-64. Available from: http://www.currentscience.ac.in/php/toc.php?vol=111&issue=11. [Last accessed on 2018 Jul 22]. Mercier E, Tardif PA, Moore L, Le Sage N, Cameron PA. Invitations received from potential predatory publishers and fraudulent conferences: A 12-month early-career researcher experience. Postgrad Med J 2018;94:104-8.